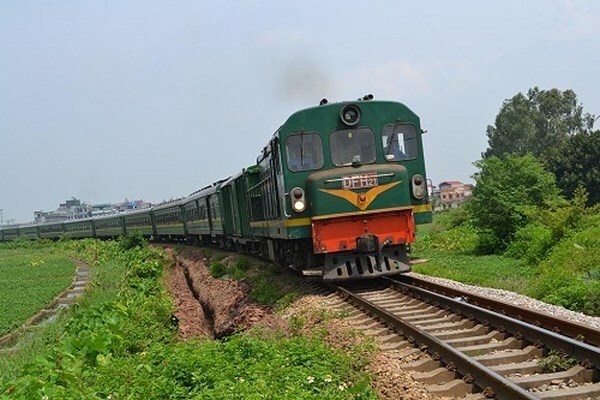 The Ministry of Transport is planning to invest in the construction of Hai Phong - Hanoi - Lao Cai (East-West) railway line 1,435mm standard in the direction of increasing the connection between seaport and international railway. Cargo volume on the Hai Phong - Lao Cai route is expected to increase by more than 130 million tons by 2020. Speaking at the meeting on the report on the planning of the railway route Hai Phong - Hanoi - Lao Cai, Vice Minister of Transport Nguyen Ngoc Dong said that this is the most important route of freight and passengers of the railway of Vietnam. The route is not only meaningful for local socio-economic development, but also in transport links, international trade, clear the feights in the northern plain in general, Hai Phong port area in particular. At the same time, attract the export of Vietnam to China or transit to Central Asia, Europe and vice versa. The route starts at Lao Cai Station, running eastwards through Lao Cai, Yen Bai, Phu Tho, Vinh Phuc, Ha Noi, Hung Yen, Hai Duong, Hai Phong privinces and terminates at Lach Huyen Port (Hai Phong), total length of the route is 391 km, in which the connecting section of Ha Khau and Lao Cai has the length of 6.29 km. According to the plan, train route Lao Cai - Hanoi - Hai Phong will exist simultaneously in both old and new tracks. In particular, the new track will take care of cargo and all passengers of the route, the existing track continues to cover part of cargo volume. New track will be built in standard size 1,435mm, speed 160km/hour, cargo train 90km/hour. Nguyen Thanh Duong, Vice Chairman of Lao Cai People's Committee said that this railway plays a very important role in promoting local economic development and trade. However, detailed planning should be updated with the planning of the localities to optimize the location of the route, paying attention to the connection with industrial parks, cultural and tourist sites of the region. On the side of the Ministry of Transport, Deputy Minister Nguyen Ngoc Dong noted that it is necessary to look at the overview of the route with the goal of increasing transportation capacity in order to locate the lines, thereby agreeing with the localities on the planning to adjust. "It is necessary to determine how to connect with old railways, how to connect to seaports, ports, cargo terminals...In particular, the three connections of railways with Chinese railways in Lao Cai, the hub areas of Hanoi and the seaport of Hai Phong. This will ensure the effectiveness of the route" Dong stressed that at the same time to pay attention to the problem of land clearance, the issue of safety at intersections with roads when planning. Talking with Transport Newspaper, Deputy General Director of Vietnam Railway Corporation Phan Quoc Anh, said the most important issue to prioritize prior implementation was the connection of railroad with Chinese railways as it is a "congestion", a great impact on transportation between the two countries, as well as transportation of goods through China export to Vietnam.